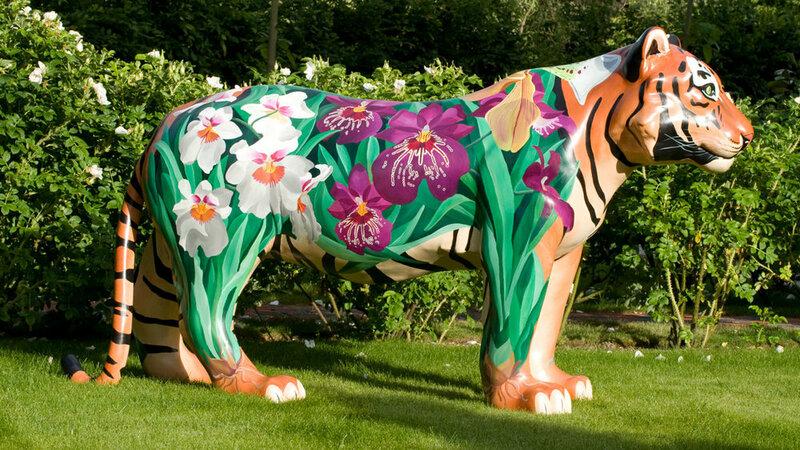 'Jeffrey, the Orchid Tiger' created by floral artist, Karen Hollis, for the Elephant Family event 'Jungle City, Edinburgh', 2011. Following on from the success of the Elephant Parade London 2010, Hollis was invited to become an official artist for the next event being planned by the charity Elephant Family. Scotland's capital city, Edinburgh, was to be turned into a Jungle City filled to the brim with iconic animals. Replacing the sounds of the city with birdsong and monkey chatter. Park benches, fountains, pavements and traffic lights would become perches, watering holes, hunting and grazing grounds. Orangutans would swing playfully between lamp posts, tourists stalked by stealthy Cougers and the cobbled streets would shake under the weight of stampeding elephants. The 120 brightly painted animals arrived in convoy, filled with the hopes of turning their fortunes around. The animals would all act as ambassadors for their species, raising funds and awareness for their relatives back home. The city will be invited to befriend the creatures and give them permanent homes. At the close of the exhibiton the sculptures were exhibited together en masse and sold via a series of high profile charity auction events. Karen's contribution was a life sized tiger which she decorated wth a variety of orchids, representing the flora and fauna of the jungle. Keeping to a similar style as 'Just Joey' Karen felt it was important for the sculpture to have a face and hence a character. The other unique characteristic is that it has different coloured orchids on each side so that whoever bought this beautiful work of art could have two different viewpoints. In the past 100 years, Asian elephant populations have plummeted from 250,000 to 25,000. If current trends continue they will cease to exist in the wild by 2050. The Asian elephant also shares its habitat with other animals that are endangered and need our help. A fifth of the world’s birds and animals and a third of the world’s amphibians are facing extinction within our lifetime... what can we do to change this? Elephant Family is dedicated to changing these statistics with the help of artists who help to generate much needed funds raised from public art events. For more information on Elephant Family please visit their web page.